More inventory: it is no secret that the housing market has been challenged by the lack of available inventory for years now. Nationwide, housing inventory hit the lowest numbers in history last winter, however we are finally starting to see a recovery. The research indicates an increase of inventory, around seven percent is projected. This is good news for home buyers who have been beat out of the market, but a new reality for sellers. Home prices: seller’s have been reaping the benefits of low inventory the last few years, but that is that could change in the buyer’s favor. 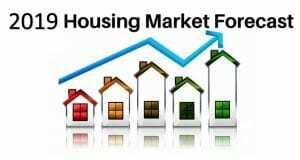 Increasing interest rates: interest rates are hovering around five percent currently and are predicted to reach 5.5 percent by the end of 2019. Income is also predicted to increase by approximately three percent, leaving a financial challenge, especially for first-time home buyers. Millennials still dominate the buying pool: millennials are the biggest pool of home buyers in the market, and contribute forty-five percent of the existing mortgages. When compared to seventeen percent for baby boomers and thirty-seven percent for Gen Xers, that is a significant foothold. While first-time buyers may still feel a pinch in home pricing and now rising interest rates, the move-up buyers will reap the benefits of their existing equity and increased inventory choices. It is projected 2020 will be the peak for millennials home buyers, and a bulk of them will be age thirty. New tax law is a wild card: this time last year, the GOP was still making revisions to the tax code and no one really knew how it might impact the housing market. Fast forward twelve months, and we still don’t really know how the new tax law will play out. That is primarily because most taxpayers won’t be filing taxes under the new law until April 2019.